The Jerusalem artichoke is neither from Israel, nor is it an artichoke. The name originates somewhere in its history of European contact. Early French explorers found a lot of these being cultivated by Native Americans over much of the Eastern part of this continent. They took samples back to France, from where they were spread throughout Western Europe (at least). I find mention of England, France, Germany and Italy. I suspect they went further. The best I can make out about the name, is that it stems from Italian. I do not speak Italian. But here's my theory: in Italian, sunflower is girasole and articulation (like in knobs) is articolazione. My bet is that the Italians used some form of these two words to tag this plant. Then, later, as in the case of so many New World plants, some Italians brought some back here. English speakers, upon hearing the Italian name for this plant, were unable to pronounce it correctly. So they settled for a “close approximation,” … Jerusalem artichoke. Though the Jerusalem artichoke is native to North America, it has not maintained much popularity among our population during the last three hundred years. So, it is easy to imagine, say, a New Yorker, having an encounter with an Italian street vendor, and going home to the family with a sack of “Jerusalem artichokes,” not being able to replicate what the vendor called them. Many being aware that the name, “Jerusalem artichoke” is far from accurate, have attempted to re-dub this plant as “sunchoke” or “sunroot.” I think “sunroot” is probably the best option. But by far, the most commonly used name continues to be “Jerusalem artichoke. The scientific name, is Helianthus tuberosus L.
This plant hearkens back to a time when people grew and foraged for much of their own food, and going out to dig some roots was considered a normal activity. I have heard that there continue to be large stands of these on the location of places which were used as winter camps by Native Americans. Sunroots, ground potatoes (Apios americana), acorns and cattails were all important foods which would have been very important, especially for winter eating. 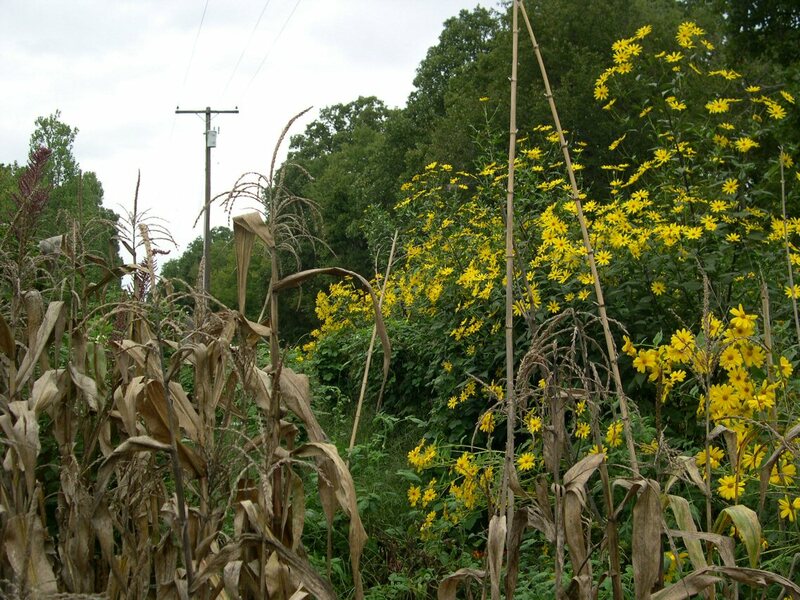 The line between foraging and cultivation was not so clearly defined by native peoples, as it has been by cultures derived from northern European sources. Our family observed this, when living out in the hills (Sierra) in Mexico. There, if a person wanted to grow tomatillos, for instance, they might simply toss some rotting fruit into their corn field. The tomatillos would come up in the spring, and they simply didn't weed them out. Then, for years to come, they had “food producing weeds.” This is pretty much the niche occupied by a good number of foods used by native peoples of this great land. There are two reasons that it is hard to pry the sunroot from this kind of niche: first, no matter how thoroughly one digs and removes the roots, enough escape for the stand to grow back in the coming year. I rarely set out to plant a row of sunroots, as it is easier simply to let them stay, somewhere where they come up on their own. Secondly, sunroots do not keep very well when removed from the soil. We are all to accustomed to “Irish potatoes,” which may keep for months, when stored in a relatively cool place indoors. But sunroots, when exposed to the open air, will shrivel and spoil in just a couple of days. I have managed to keep them for months, if I place them in a plastic bag with a wet paper towel, in the refrigerator. But even in the crisper drawer, if left exposed to the air, they will quickly spoil. On the other hand, sunroots, if kept in place, in the garden, will be perfectly palatable until they start sprouting in the spring. In fact, their flavor improves with exposure to freezing temperatures. And, I have actually chipped them out of frozen soil, and found that they are non the worse for wear! When I was a kid, growing up in NJ, my parents raised sunroots. We mulched in the fall, so we could easily dig them all winter. Here in Oklahoma, I don't even mulch. I can break them free at almost any time. Jerusalem artichokes are nutritious. I understand they are good source of potassium and starch. They are rich in fiber and calcium, and they provide needed calories. They do, indeed work in the place of Irish potatoes, for most things. However keep in mind that they are not as easy to use. The main challenge to be faced is that their starch is not the same as that found in the Irish potato. It is a starch called inulin, which is harder to digest. This is an advantage for those who struggle with blood sugar. But it is very bad news for the person who lacks sufficient fauna in their digestive track to break inulin down. “Death by flatulence” is the term that comes to mind! Though I seriously doubt anyone would suffer real physical harm from eating these: pain, yes, emotional trauma,... possibly. The key to successfully using sunroots is to boil them, first, drain the water and then cook them however desired. This may mean boiling them again, baking, or even frying as French fries. Boiling and throwing out the water removes a fair amount of the inulin, making them less flatulent. I might also add, that I have used sunroot, completely, as a potato substitute, in a stew which was slow cooked all day. The result is absolutely delicious, and perfectly digestible. They are also tasty when eaten raw. Many say that they are similar, when consumed in this manner, to a water chestnut. I have never met anyone who complained about flatulence when eating them raw. Sunroots can grow anywhere from 4' to12' in height, depending on growing conditions and the strain planted. There are a couple different colors of root available. 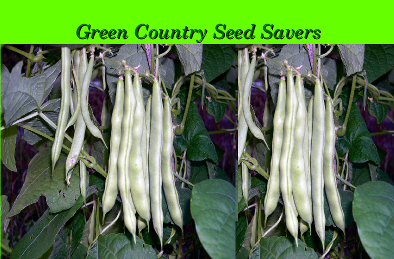 They do produce seed, so it is not uncommon to have a volunteer pop up a good distance from the patch. A seedling will produce a full sized crop of roots its first season. Jerusalem artichokes can make a beautiful sight in the late summer or fall, when they burst into flower. Honeybees love to work the flowers, which look like miniature sunflowers. The sunchoke is a high producing plant. In my garden, one single plant can produce up to 40' of roots. They are so productive that often, the ground heaves at their base, from the bulk of roots forming there! The only nemesis to this plant I have found are rodents. Rats, mice and voles adore the roots. One year a groundhog even made his tunnel in our sunchoke patch, unnoticed until several plants died. We lost a bushel or two of roots, perhaps. But the groundhog was delicious! Don't think that you can get away with growing these in a pasture with grazing animals. All ruminants adore them. When does one plant Jerusalem artichokes? They can be planted anytime, from November until May. Here in Oklahoma, they start sprouting in April. But I have actually stripped off the sprouts in order to ship roots, and they re-sprouted and grew just fine. They are very easy to plant. Tilling isn't even necessary. One could simply use a breaker bar and punch a hole in the ground, dropping a piece of root into the hole, and tamping it shut with the foot. Plant these about 2-3' apart. Their roots will extend at least 2' out from the initial sprout. I have grown them along a fence, in the lawn, with no problem. They do even better in a garden with amended soil. A bright note for the turning of the year! Nice review, macmex ! We grow these at the Murrell Home. In fact, we just dug them up, and we have them for sale in our gift shop right now! I only had about 10 roots, so I planted mine all in a circle atop a compost heap. They are so showy with their bright yellow flowers that I wish I had planted them as a hedge instead. I guess when I dig them for their roots, I'll have to replant some in a nice row somewhere more visible from the house. They are a great addition to salads, or just to peel and enjoy as a fresh snack while walking along in the garden. I like to munch on them in the evenings about 8:00 pm as I sit in the shade and watch the tiny yellow finches enjoying the flower heads and tomato seed I spread out for them. 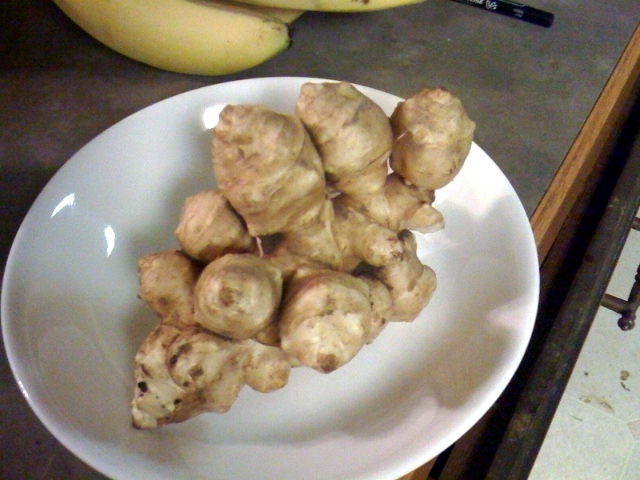 I dug one of my sunchoke plants (Jerusalem Artichoke) and got 2-1/2 pounds of really sweet, crispy, crunchy, roots! It was 3 below zero here on December 19th, I guess that really helped to sweeten them up, despite it being nearly 60 degrees ever since. We've been enjoying fresh sunchokes all afternoon. I've got several more plants to dig, but no hurry, they store under the ground just fine. So far, no varmints have discovered them. The only thing better than watching them grow is eating them in the dead of Winter. I have the leftover stew on very low, in the crock pot. I think that puts an end to the flatulence issue. But I couldn't wait to serve them at lunch today. They had only simmered for a little over an hour. Lewis and Clark mentioned on one of their expeditions that they had eaten dinner with a group of Nez Pierce Indians that they met along the way. The Indians shared with them a cooked root crop something similar to potatoes... The next day, their journey had to be postponed due to several of the men becoming doubled over with gas pain and unable to go on. I think that root crop was probably prairie turnips but sounds like it was pretty rough on them when eaten cooked rather than raw. I've never eaten sunchokes cooked, but have eaten several of them raw with no noticed ill-effects. Although, I only snack on them throughout the course of the day... I've never made a meal of them. When I was a teen I would carry Jerusalem artichokes with me when I would camp alone in the woods. A lot of times I simply spent the night out there, and without a fire. I would eat them raw. They were delicious and never gave me any trouble at all. But cooked, you're right, they can cause a lot of gas. My wife had abdominal surgery in October and she suffered last night. It could well be that the jchokes caused too much flatulence and her tender tummy suffered for it. I've used them in stews, as a potato substitute, before, and with almost no problem. But I set that stew on top of our wood stove for the entire work day, before we ate any. I suspect the long cooking helps. In normal use, if one cooks and eats these, it is important to boil once and discard the water and then boil again. After that they can be used in any way a potato would be used. Some people are more susceptible to the flatulence problem. Also, I suspect that consuming small amounts of the cooked roots, over time, would enable ones body to develop the intestinal culture to better handle them. Just like beans, if one hardly ever eats beans, then the flatulence problem from eating them will often be much worse than if one ate some frequently. I'm conducting a culinary experiment today in the name of "Sun Choke Science". Today is Sunday, January 1, 2017. I made a pot of soup this afternoon with the bone and leftover meat from a bone-in pork roast that I had smoked and fixed in the crock pot on Friday afternoon. I added to the broth, 2 pounds of sun chokes cubed into 3/8" chunks, then about 3 pounds of frozen, diced, tomatoes that I put up this Summer, a pint jar of corn, a pint jar of green beans, a few small carrots, a small can of tomato sauce, a little garlic, some freshly ground pepper corns, a generous amount of Kosher salt, a medium onion, and five Russet potatoes cubed into 1/2" chunks. I put the kettle on soon after we got home from Church, so about 1:00 pm? I cooked it hard enough to take the crunch out of the potatoes, then, simmered it until 6:00 pm. I've either got a cast iron stomach or the 5 hours of simmering fixed the sun choke gas problem? No ill effects noticed, so I guess I'm hooked on using the chokes as potatoes from now on. I will try the same experiment this week. I cooked the "offending stew," which affected my wife so badly, overnight. Then, I froze enough for two lunches for me. I'll carry at least one to work this week and see how that works. Even when the stew was "gassy" it didn't cause me any discomfort. But it did cause gas. So, I'll see how it works. I doubt I'll get Jerreth anywhere near J chokes in food for the 2017 year. Since her gastrointestinal tract is still sensitive from surgery, she'll play it safe. The gas hit me later than I expected last night, but it definitely hit. I had a doctor tell me once, "Gas from beans or cabbage is a healthy thing..." According to the doctor, "Anywhere gas occupies the lining of the colon is a place no other bad thing can take refuge." According to that train of thought, there must have been times during the night that I had to be the healthiest person alive! Although, I'm not 100% sure the gas was entirely from the sun chokes? The experiment may have been skewed by the fact that no one in my family will eat black-eyed peas on New Year's Day, so I had to eat the whole can by myself. Either way, it caused me no discomfort. Guess we should check with Margaret . . . . Yesterday, the grandkids came down and we cooked about two pounds of sunchokes, with two pounds of smoked pork, a stick of real butter, some onions, a little garlic, some black pepper, and 2 cans of sour kraut. I usually make this dish using potatoes, but we used sunchokes yesterday instead. Three guesses why the grandkids wanted sunchokes instead of potatoes... We had fun, but I'm not sure mom appreciated the humor. I just started my Jerusalem Artichokes in the early Spring of 2016. I can't believe how many more there are this year, after having dug so many of the roots for stew last Winter. They are prolific producers and a very attractive addition to the landscape as well. The Indigo Buntings, yellow finches, and bees enjoy their blossoms. Our family enjoys the bright yellow flowers as cut flower arrangements, as well as a 'pick me up' in the mornings. Just seeing their bright colors in the fields is a joy. Thank you, fellow Green Country Seed Savers, for the starter roots that you so generously passed on to us. We hope to return the favor by passing them on to others.